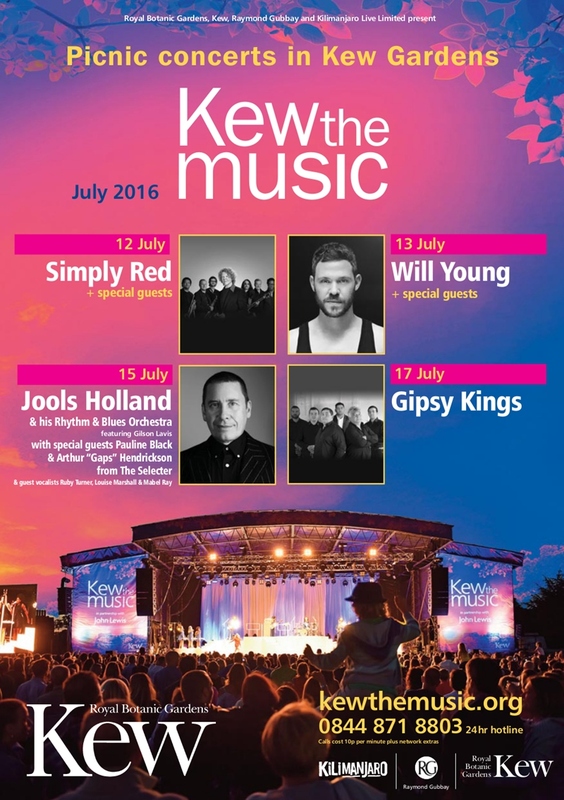 KEW THE MUSIC is a glorious week-long festival of outdoor Summer concerts set inside the stunning grounds of Kew Gardens. Returning for its sixth year with a truly fantastic line up of artists, these festival-style concerts are renowned for their magical and relaxed atmosphere. Guests are welcome to bring their own food and drink, or to enjoy the many artisan food stalls and bars on site. 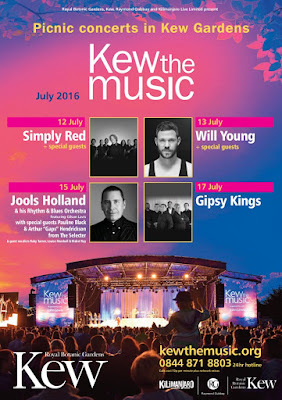 Simply Red open this year’s Kew the Music. Regarded by many as one of the great British bands of the 80’s and 90’s, Mick Hucknall’s distinctive voice defined the sound of British soul music. Following their acclaimed new album Big Love (Released June 2015), Simply Red will be performing their greatest hits for Kew the Music with iconic songs such as Holding Back the Years, Money’s Too Tight (To Mention), If You Don’t Know Me By Now, Stars and Fairground. Will Young is one of the UK’s best-loved pop stars. His highly acclaimed latest album 85% Proof went straight to the top of the UK Official Album Charts (May 2015) and is considered to be his most accomplished work to date. He has released six albums and dominated the charts with singles such as Love Revolution, Friday’s Child, Leave Right Now, Grace and All Time Love. He has also collaborated with Groove Armada on their album Black Light and performed with James Brown, Elton John and Burt Bacharach. He has sold over nine million records, won two BRIT Awards and an Ivor Novello Award. Jools Holland returns this year with yet another crowd-pleasing show. Jools has been touring with his veritable musical army, the Rhythm & Blues Orchestra, for more than 20 years and once again he will be joined by regular guest vocalists, Ruby Turner and Louise Marshall. This year, Jools’ special guests are Pauline Black and Arthur ‘Gaps’ Hendrickson from The Selecter. The legendary Gipsy Kings achieved world-wide recognition in 1988 with the release of their eponymous album which featured the global smash hits Bamboleo, Un Amor and Djoba Djoba. In 2013 the band released their latest album, Savor Flamenco, which won a Grammy Award for Best World Music Album. The band are all members of two related families from France and are credited with being responsible for bringing the sounds of progressive flamenco to the world. Tickets from £43.00. Booking fees apply. Kew the Music is a collaboration between Kew Gardens, Kilimanjaro Live Ltd and Raymond Gubbay Ltd. Royal Botanic Gardens, Kew have been presenting Summer concerts for over 30 years.